“Everything is a lie. 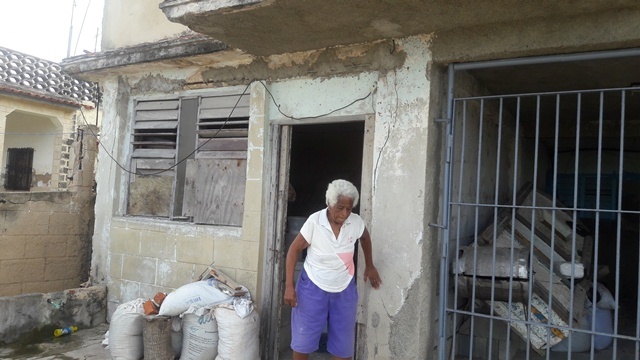 The State doesn’t protect the victims,” says Reina Ester de la Cruz Ramos, an eighty-something-year-old resident of the municipality of Santa Fe located in the northwest of Havana. Reina Ester tells us that it all began in 1983, when the sea forced its way to her home and flooded her street and some adjacent ones. Reina Ester shares her small flat with her daughter Zoraida and her granddaughter Estela. Zoraida shows us the single room of the flat, where they all sleep on a bed raised on blocks. Then she shows us how high on the wall the water raised when Hurricane Irma hit the area. Then her face turns sad and she lowers her voice when she remembers her mom, Juana Ramos Tomé, who died after witnessing the destruction caused by the sea during the ‘storm of the century’, which had robbed them of everything. Her daughter Zoraida also grows nostalgic and confesses that a similar thing happened to her mom during hurricane Irma in September 2017. Clara Matos, a neighbour also living in the Calle Primera street in Santa Fe, claims to be another hurricane victim who has also received no help from the National Assembly.